Not cheap by any stretch, but the extensive sonic capabilities of this beast may yet seduce you. Classy sound. Ergonomic design and immediate to use. Effects, including Tube circuit, add pleasing levels of grit. Could do with more user programs. Can't edit arpeggiator directly from front panel. Leading up to the Winter NAMM show, images leaked of a new high end synth from Korg designed to combine multiple Oscillator and modeled filter types and be just as well suited to the stage as the studio. Social networking rumours grew and, sure enough, here we have the boldly named KingKORG. Not too long ago, we remember having the Moog Voyager XL for review and describing it as the kind of synth you'd design if you had nothing but photos of Moogs to cut up and paste together in Photoshop. Fast forward to early 2013 and those memories are jogged by the synth that now sits before us. So, is it the sonic equivalent of a giant ape scaling the side of the Empire State Building? 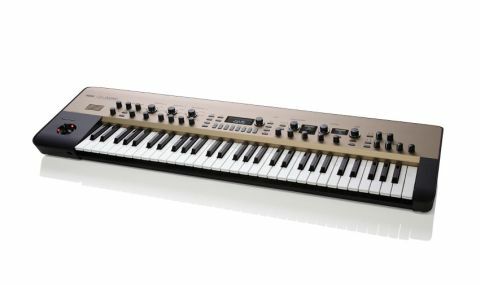 "Billed as a Performance Synthesizer, the KingKORG's is designed to stretch from studio to stage"
Billed as a Performance Synthesizer, that suggests the KingKORG's appeal is designed to stretch from studio to stage. Of course, your desire to use it in either capacity will depend entirely upon how it sounds. Fortunately, Korg knows its onions in this regard and its latest toy uses a new XMT (Xpanded Modeling Technology) engine to provide sound sources across a wide range of tones from accurate sample based models to rich, analogue hybrids. KingKORG is a three oscillator model enabling each of these sources to draw from four different engines that are Analog, DWGS, PCM or Mic In. Setting these up for each Oscillator is a joy. To do so, click on the Oscillator you're tweaking and either scroll through the waveforms sequentially or press the Type knob to jump from one to the next. Meanwhile, the dedicated Oscillator screen keeps you updated with your choices. All of this is available 'twice' if you choose to Layer or Split the keyboard, with up to two Timbres that can be played simultaneously. The Filter section adopts a similar approach with a number of modelled Types. There are 18 available, including MS-20 replicas and Acid options that represent thinly veiled references to the TB303 filter. Indeed, SEM, Minimoog and Prophet 5 filters are also modelled here. Filter Cutoff, Resonance and EG Amount dials are offered, letting you configure the majority of filter settings on the fly. To the right, you will find Amp controls including a Level dial, plus Unison and Vocoder buttons. The latter of which utilizes the XLR mic input on the rear panel and the mic Level dial on the far left-hand side to provide 16-band vocoding. Programs 196 to 200 provide instant Vocoder ready Programs and are a lot of fun. We should point out that while KingKorg provides 300 Programs in total, only 100 of these locations are yours to 'save to' with Programs 1-200 providing factory sounds - not as generous a split as it might be. Elsewhere, the panel's right-hand side is completed with twin LFOs and ADSR envelopes with ready access to Filter/Pitch and Filter/Amp assignments. "The upper left-hand side of the panel is taken up with effects and, in this respect, KingKORG is well stocked"
The upper left-hand side of the panel is taken up with effects and, in this respect, KingKORG is well stocked. Effects are divided into different modules with Pre FX, Mod FX and Rev/ Delay sections available for Timbre A and Timbre B if you're using Layered/ Split programs. The Pre FX section provides Amp and Distortion settings, the Mod FX offers doubling effects including Flanger, Chorus and Tremolo, and the Rev/Delay engine offers a range of Echo types or Plate, Room and Hall Reverb algorithms. The coup de grace is a Tube Driver circuit through which all sounds pass. This option includes an On button, a Drive dial and, if you're feeling nasty, a Boost button - hold onto your hats if you choose to activate this bad boy! What's most pleasing is how hard KingKorg's design has been considered. You can reach for most of the functions you'd want with 'critical' settings for each section of the synth clearly labeled and readily available. Of course, there's a more comprehensive list of parameters onboard selectable via countless Pages. Some of which, including designing Arpeggiation patterns, are welcome, if not quite as intuitive as the rest of the synth's layout. Bearing in mind how great the Arpeggiator sounds, we'd like to be able to edit it directly from the front panel, especially as there's (just about) enough room above the main screen. 2013 marks Korg's 50th anniversary and, in some ways, the KingKORG is the ideal instrument to mark the occasion. Its synthesizer roots draw influence from a long line of Korg classics including the MS-20 and MS2000, and its physical modeling echos pioneering products such as the Z1 and Prophecy. Though it has been designed as a hybrid instrument - in terms of its studio/stage credentials and through the nature of its sonic engines - there's a pleasing uniformity to the KingKORG's sound in that it definitely has its own sonic identity. A warm, consistently rich instrument, whether you want it for piercing leads or smooth pads - and in an age where too many synths try to be everything to everyone - it's pleasing to find an instrument with its own character. Our gut feeling is that it's a little too expensive and while we can understand that, relative to buying the equivalent hardware from which it draws its sounds, KingKORG is a steal, meaning those purchases aren't a viable alternative for many. That said, if you're looking for a synth with a well-designed interface, cracking sounds and scope to create your own, get in front of this instrument and judge for yourself.